Garment Printing should be your first choice when you’re trying to order printed lanyards. We offer all types of printed lanyards which include flat polyester lanyards and nylon lanyards as well as various other materials which are ready to be personalised with your company name, logo and brand message. We can also create truly bespoke lanyards, which use the materials, colours and fittings of your choice. Around the world, lanyards have become one of the most popular printed promotional items as they offer the perfect way of kitting out your staff with bright and bold branding. They are also a low-cost, well-appreciated promotional item that can be given away to potential customers. Anyone who uses your branded lanyards are then advertising your company on your behalf. 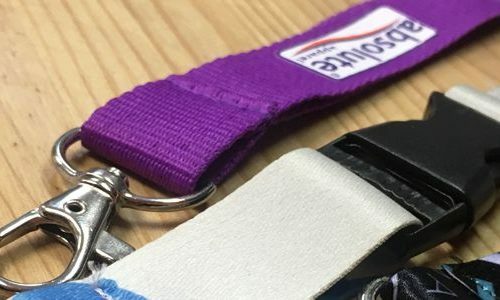 You can also print with us plastic lanyard safety breakaway connectors from as low as £0.24 per unit and even design Bottle Holder Lanyards, the starting price for which is just £0.21. Our ranges of different lanyards are fully customisable and can be printed on in a number of different ways. This means that we can create bespoke designs, which stand out and help to grab and retain attention from potential customers and passersby at events and conferences. Our printing techniques are able to create all of your designs and we’re able to recreate bold and vivid colouring as well as using Pantone colour matching to ensure all of your brand guidelines are met. The most popular printing techniques for lanyards used by our clients are Sublimation, Silk Screen printing and embroidery. You can choose the one that fits best your need and company image. These techniques can be used almost on all types of garments including polyester, nylon, cotton etc. For lanyard safety breakaway connectors and bottle holder lanyards, we can only use silk screen printing and heat transfer printing. hook, bulldog clips, or many others. Contact our sales team to find the most suitable option for you. Versatile, durable, practical and simple, printed lanyards can increase your workplace security, raise brand awareness and also improve your sales. It will elevate your professionalism and your status and it will make your brand easily recognisable. With so much choice it can be difficult to decide on which lanyard and printing technique best suits your needs. To guide you along the way, we have a team of printing and design experts who are on hand to help you through every step of the process to make sure that your printing is done to the highest possible standards and to your exact requirements. Get in touch with us for a no hassle quote.